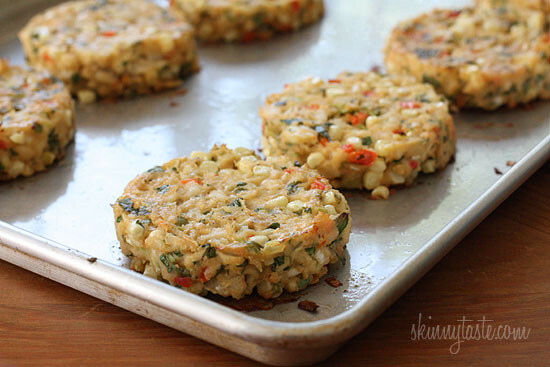 Deliciously baked lump crab cakes with sweet end of summer corn. 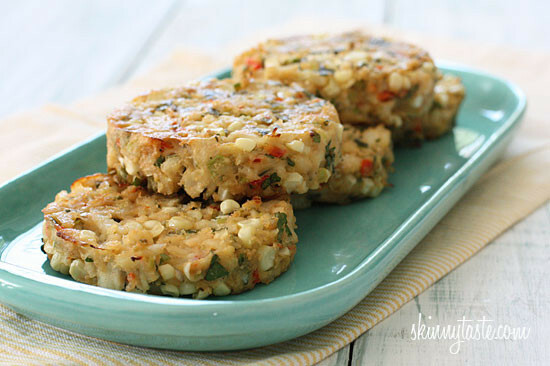 I love making a quick batch of summer crab cakes for dinner on those lazy hot evenings. Some of my other favorite versions are Waffled Crab Cakes, Baked Lump Crab Cakes with Red Pepper Chipotle Lime Sauce and even Crab Caked Benedict with Avocado Relish (also good as a breakfast!). The end of summer always makes me a little sad. I love the warm weather, sunshine, being outdoors, and of course the selections of fresh fruits and vegetables available to us. There is a small part of me that is excited about fall and the change of seasons, but I am absolutely getting the most out of my favorite summer vegetables while I can. 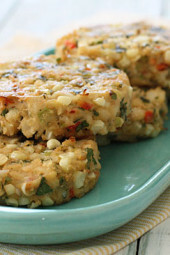 These crab cakes which I adapted from this recipe were delightful with little sweet bits of corn in each bite. There is no need to cook the corn, it cooks as it bakes. Serve these with a salad and some fresh garden tomatoes and you have yourself a meal. The trick to making sure the crab cakes hold together is to refrigerate them before baking, so don’t skip that step. 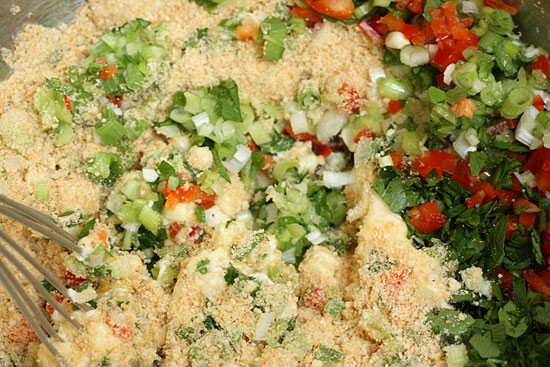 In a large bowl, combine corn, crushed crackers, eggs, scallions, pepper, mayo, yogurt, parsley, lemon juice, salt and pepper. Gently shape into 8 patties using a 1/2 cup measuring cup. Chill in the refrigerator at least 1 hour before baking. Bake about 12-14 minutes on each side, or until golden brown. This was delicious but took a long time to prepare. More of a weekend dinner than a weeknight dinner but we will make it again. We truly enjoyed the flavor. Maybe if my knife skills were better or I used a food processor it would be better but mincing all those things took a lot of time. I have made these several times, and while a little messy, they always turn out great. I usually serve it on a bun with a mix some non-fat greek yogurt with old bay seasoning as a spread. They also freeze very well. Make sure to use real lump crab. I have tried with canned and it's just not the same. Just as a note, if you are trying to avoid high fructose corn syrup, watch out for those 30 ritz crackers. I'm sure there is a less processed alternative. Perhaps substitute with panko? This looks fantastic and I live near the Gulf Coast – fresh crabmeat is easy to come by. Gina, do you have any ideas for a Weight Watcher friendly comeback or remoulade sauce to top with this? The carbs are too low on here. 1 cup corn is 40g carb and 30 Ritz crackers are 60g carb. 100/8 servings = 12.5 per crab cake, not 7.5. A big difference for someone who is eating low carb. Made this tonight and it was AMAZING! Also made the Zesty Lime Chipoltle Sauce and it was a perfect condiment. Probably a little time consuming for a Monday evening but was dying to try before all the fresh corn is gone. Can't wait to have friends over and blow them away with it. Great recipe. I added a little Old Bay which worked well. Made this tonight, very yummy! Is the corn cooked or raw? These look amazing. I can't wait to give them a shot. Thanks, for all you do. This was delicious! I subbed 1/4 a cup of breadcrumbs bc I live in Germany and can't get Ritz crackers. They were still delicious! Made this today with your chipotle red pepper lime sauce (from the other recipe) and it was absolutely fantastic! I can't believe it came out of my oven. I do highly recommend the sauce – it wasn't too spicy, just right. Delicious. Thank you! I love your recipes! Do you think I can use shrimp instead of the crab? 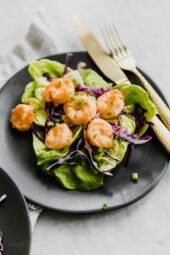 I have some small shrimp and really want to try this! Please let me know! Can I not use the corn? I never knew to refrigerate before baking them! Thanks for that tip! Have corn ready to go for this recipe- yay! We have tons of fresh caught salmon in our freezer – think I could use that instead of crab? This sounds great – but if you are on a gluten-free diet, any suggestions for replacing the Ritz crackers? Ohhh what a yummy recipe! I just love crab cakes!! I may just have to get cracking on this! Thanks for the recipe and all that you do, Gina! Any recommendations for good canned brands to purchase? Unfortunately, I am very far away from the coast (in Dallas, TX) and likewise the freshest of the fresh seafood. If I wanted, I could purchase cooked crab meat from a higher end grocery store like Whole Foods or Central Market, but it's expensive. I did see a live Dungeness Crab in a tank at Central Market last week (makes me miss San Francisco), but there's no way I'd ever cook it myself. I just don't have the cajones for that! im new here. your website is awesome but i was kind of confused about how the point system worked. the points system is a weight watcher thing. Have you double checked the calories? I entered the ingredients into the My Fitness Pal app and told it 8 servings and it's telling me 1 serving is 142 calories. I still love your site and think your recipes are delicious. 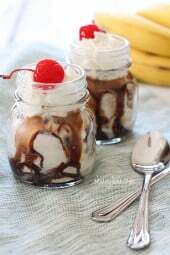 I actually plan on making these tonight with a couple substitutions. I wanted to make sure my calories were still comparable and couldn't figure out why I was coming up with so much more than you. I love crab cakes.. this looks like a great remodel. So, tell me.. how do you make your patties so perfect and with an "edge"? Do you know if you could freeze the extras? I used to frequent a high end resturant that served crab cakes over a bed of european salad greens with a balsamic vinegar dressing. Going to try this with that twist…thanks for inspiration.. This looks super yummy! I have a shellfish allergy. Do you think I could make this wth chunk chicken? In theory it should work, maybe even tuna fish. Any whoo great recipe and I am definitely inspired to add corn to our dinner this week. I'm lucky to live on the coast! I used to go crabbing for fun and make a great sauce, I need to find the time to do that again. This looks delicious. If you don't have fresh corn can you use frozen corn? P.S. I made your lobster roll recipe over the weekend, and made the baked zucchini sticks to go along side. Loved it! Gina, have you ever done a recipe like this with imitation crab? I have some in the fridge right now, and am tempted to put it to use in this recipe. No but I'm sure it would be quite tasty. How do you buy the crab? I have never purchased it. Is it in a can or fresh? These look divine! I buy it fresh from my seafood store, but you can also get it canned. Great thank you! Can't wait to make them. Looks so good! My husband is sauce person, would you recommend any type of sauce to go on top or on the side? I liked to my other recipe above which has a roasted red pepper chipotle sauce, it's really good if you like some kick! That's perfect for us! Thank you! 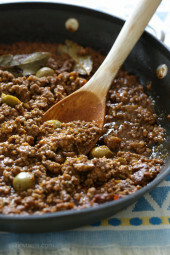 Make this with a corn and tomato salad! This looks positively WONDERFUL! I happen to have 6 ears of corn waiting to be used in the kitchen. What a shame!